Offices in China, 1919, 2¢ on 1¢ green, right margin plate no. "13222" block of six, tied by "U.S. Pos. 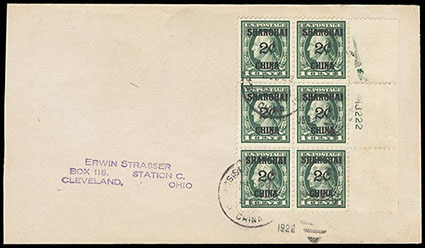 Service, Shanghai, China, Dec 29, 1922" duplex postmarks on cover to Cleveland, O. just two days prior to the closing of the U.S. Postal Agency in Shanghai, Very Fine, a very rare plate block usage on cover; with 2014 P.F. certificate. Scott No. K1 Estimate $750 - 1,000. 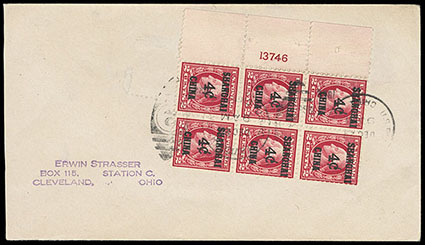 Offices in China, 1919, 4¢ on 2¢ rose, left margin plate no. "13746" block of six, tied by "U.S. Pos. 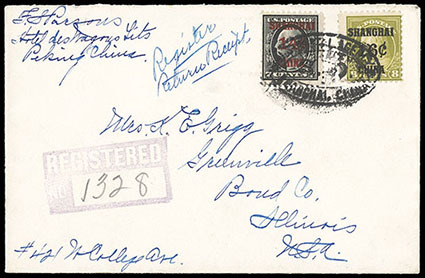 Service, Shanghai, China, Dec 29, 1922" duplex postmarks on cover to Cleveland, O. just two days prior to the closing of the U.S. Postal Agency in Shanghai, Very Fine; with 2014 P.F. certificate. Scott No. K2 Estimate $500 - 750. Offices in China, 1919, 14¢ on 7¢ black, in combination with Offices in China, 1919, 16¢ on 8¢ olive green on registered return receipt cover to Greenville, Ill., tied by "U.S. Postal Agency, Shanghai, China" oval handstamp, registry etiquette handstamp and reverse with "U.S. Postal Agency, Shanghai, Aug 17, 1922" origin cds and appropriate transits, includes the original return receipt slip bearing matching cds, Very Fine; with 2015 P.F. certificate. Scott No. K7+K8a Estimate $500 - 750. 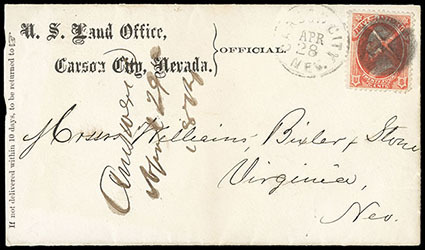 Interior Dept., 1873, 24¢ vermilion, well centered with vibrant color, tied by clear strike of "Carson City, Nev. Apr 28" cds duplexed with cork on "U.S. Land Office, Carson City, Nevada" official imprint to Virginia City, Nev., 1874 docketing, with original U.S. Land Office letterhead 1874 enclosure; reduced slightly at left, Very Fine and choice, ex-Starnes; with 2018 P.F. certificate. Scott No. O22 Estimate $3,000 - 4,000. ONE OF THE FINEST OF EIGHT RECORDED 24¢ INTERIOR DEPARTMENT COVERS IN THE CAMPBELL CENSUS, THE ONLY ONE USED FROM NEVADA. This is number 9 in the Campbell census of high-value official stamps on cover by Alan C. Campbell (Chronicle No. 188, November 2000, pages 287-299). The use of a 24¢ stamp on a small non-registered cover is enigmatic, but perhaps confusion of the stamp value resulted from all values of a department having the same color.